Extra, extra! Read all about it! The latest collection of poetry by veteran poet Joe Rosenblatt is finally here! That’s right. We here at the Porcupine’s Quill are happy to announce the publication of The Bird in the Stillness, a new book of poetry that rejoices in the myriad facets of the natural world, from the lowly insect to the lofty tree, and everything in between. Including, to be sure, the Green Man—fearsome, feral, resplendent. This book is a true spiritual and artistic buffet. If you find beauty and inspiration in nature, this collection is definitely for you. In celebration of this “book birthday”—and National Poetry Month—we want to offer you a free gift to help you sample the goods. Enter below to receive your free broadside, pulled from the pages of The Bird in the Stillness and designed by PQL’s Tim Inkster. Simply tweet your participation in the giveaway. Don’t have Twitter? No problem. 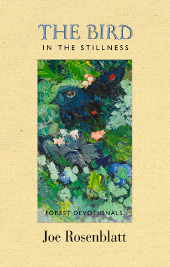 You can enter just by learning more about The Bird in the Stillness on the web. NOTE: Since this is a high-resolution file, it may take several minutes to download. Be patient—it’s worth the wait! Giveaway available to first 100 entrants. Open while supplies last or until 11:59:59 p.m. EST on April 30, 2016. This entry was posted in Letters from the Porcupette (the Intern's Blog) and tagged broadside, giveaway, Joe Rosenblatt, The Bird in the Stillness. Bookmark the permalink.